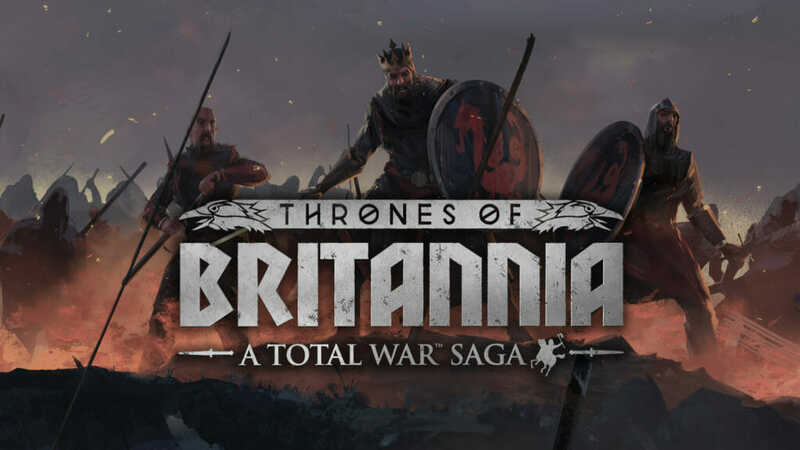 Welcome to the second Thrones of Britannia blog from Lead Developer, Jack Lusted, and it’s a big one. Today we are revealing the campaign map, showing you all the factions, provinces, and settlements of the British Isles in 878 AD. But first off, it’s time to talk size. 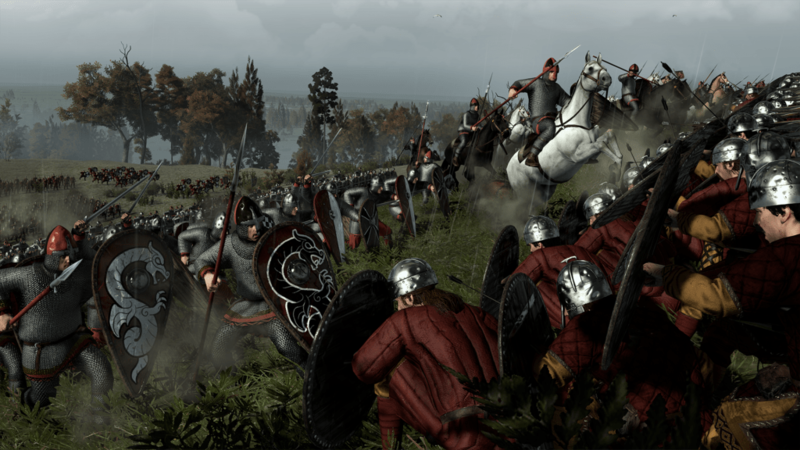 When the Total War Saga brand was announced, there was a lot of discussion about what kind of size the games would be. Some assumed we were talking about something similar to a Campaign Pack DLC, or that the campaigns in Saga titles would be smaller than in our other games. The best way to illustrate how this isn’t the case and to show how big the campaign map for Thrones of Britannia will be is to do a side by side comparison. 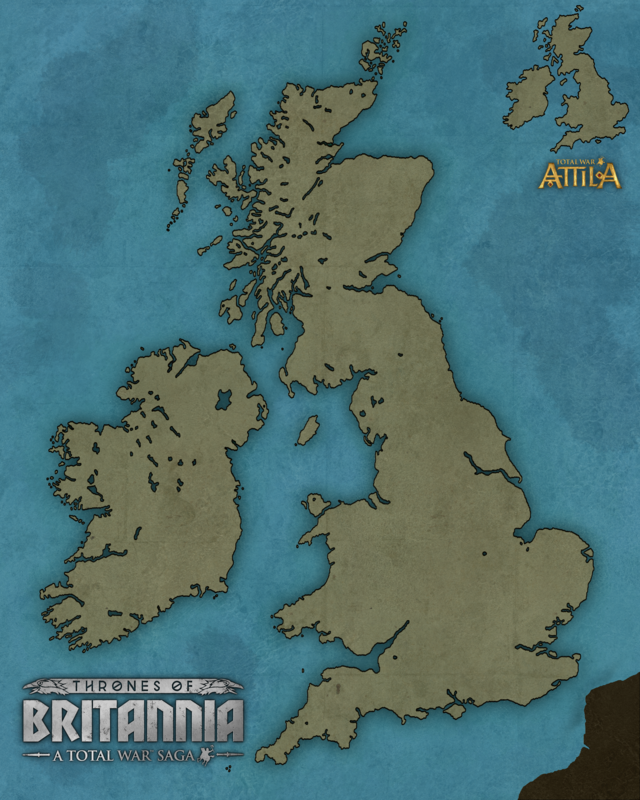 Here we compare the size of the British Isles in the Thrones to how they appeared in Total War: ATTILA. It’s 23x bigger, resulting in the largest, most detailed version of the British Isles featured in a Total War game. You can see how it allows for us to put a lot of detail into the coastlines, especially in the Western Isles of Scotland. The overall map is comparable in size to the whole Grand Campaign map in ATTILA. Doing a map this zoomed in allows us to use actual terrain height data as the basis for the height maps we use for both battle and campaign. There have to be adjustments for the needs of the game, but we’re starting with the reality and editing from there. And all that detail allows us to paint a pretty accurate picture of the time period as well. There’s a few things to talk about here, first the naming convention used, second how we approach the distribution of factions from a game design perspective, and third the history of the era and how we went about researching it. For most of our titles, we like to keep the amount of territories the player controls at the start fairly consistent to keep things balanced. 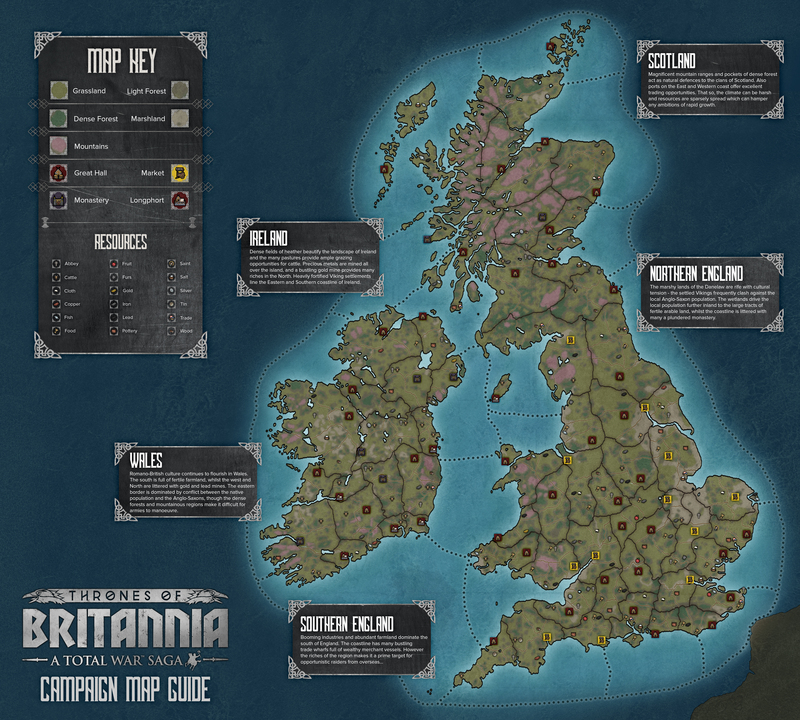 To keep to this we’ve broken up some of the bigger factions of the map, with parts of their territory. A good example of this is West Seaxe. In reality, it’s likely that by 878 AD West Seaxe had control over almost all of the South of England, from Cerneu to Cent. But this would give them almost nine complete provinces under their control at the start of the game, which is a bit much. So we looked at the territories within their lands that we know had Ealdorman, the Anglo-Saxon equivalent of later Earls or Dukes. This then let us break off Defena, Suth Seaxe, and Cent, as well as the recently conquered lands of Cerneu. 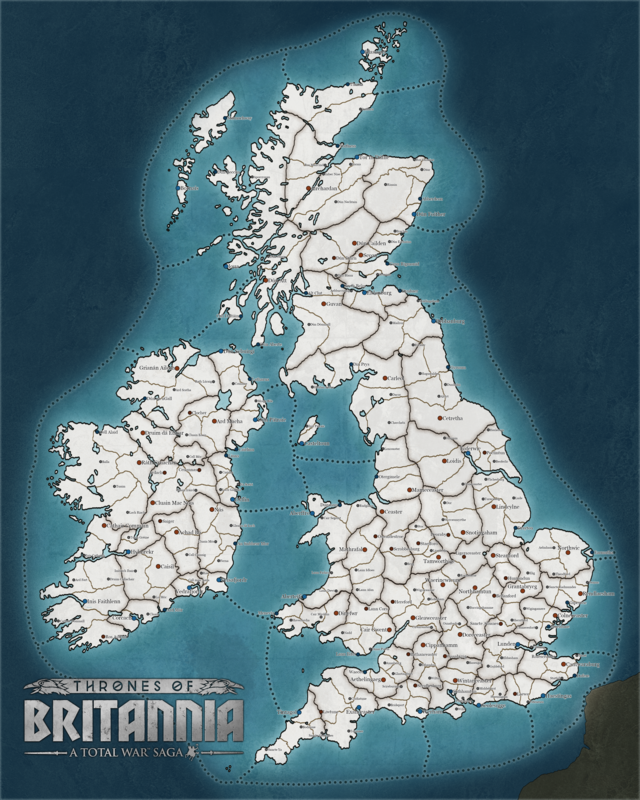 Having the last as a separate Welsh faction, still a vassal of West Seaxe, allows also for the possibility of them breaking away, which adds to the potential directions a campaign can take, and more story possibilities. Personally, I find this a fascinating period to research, both for what we know and what we don’t. For much of the map we can use annals from the time to help define what factions should exist. The Anglo-Saxon Chronicle for England, Annales Cambria for Wales, and the Annals of Ulster and others for Ireland. But other parts of the British Isles are more challenging, specifically the area North of the River Humber. Scotland goes through something of a second dark age during this time. It was thought an annal was kept at the monastery of Iona (Ioua on our map) that recorded many events in Scotland for the 7th and 8th centuries. But historians believe the details of that annal we know only survive from a copy that was taken to Ireland, and the full Iona chronicles are lost to history around the time the Viking raids begin. 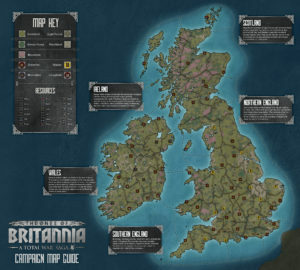 This means that there is no direct chronicle or annal from Northern Britain or Scotland from the era the game covers, which presents some challenges. 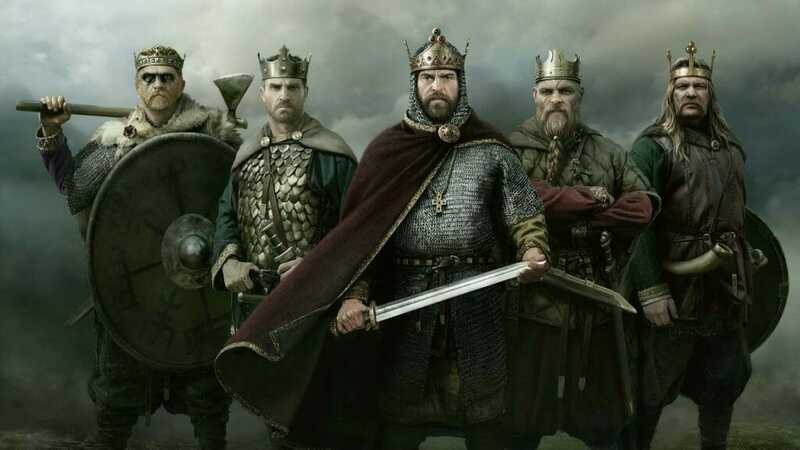 Luckily we have been able to work with Dr Neil McGuigan from the University of St Andrews, who has specialised in this area, to help make sure we’ve ended up with the most historically authentic depiction we can. I can’t thank him enough for the helps he’s provided, as he’s helped fill in gaps and present us the latest historical thinking on the era. Oh, and to finish talking about factions, I can say that there are 10 playable factions with Westsexa being one of them. We will reveal the rest of them between now and release. Can you guess which ones they might be? A straightforward map, showing the names of all the provinces and sea regions on the map. Again, we’ve followed the same naming convention as for factions, getting as close to the time period as possible. You’ll want to click on the bigger version of this image to see all the settlements names. We’ve again gone for time period appropriate names. 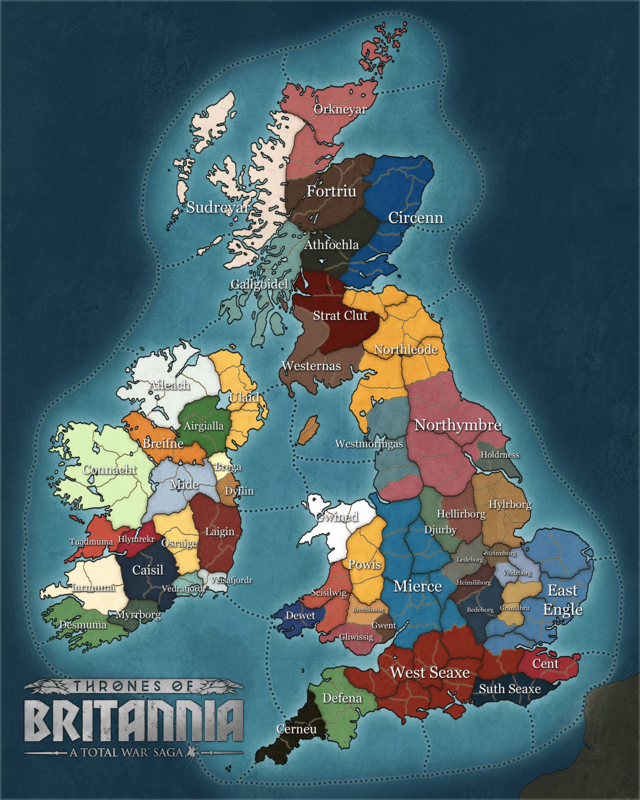 From this image, you’ll probably be able to work out there’s been a change in how provinces are constructed for Thrones of Britannia. They’re still made up of multiple regions, as in WARHAMMER or ATTILA, but we’re trying something different with the laydown of settlements therein. Province capitals are still walled and have 6 building slots as well as garrisons. Minor settlements do not. They will have no walls and either one or two building slots . 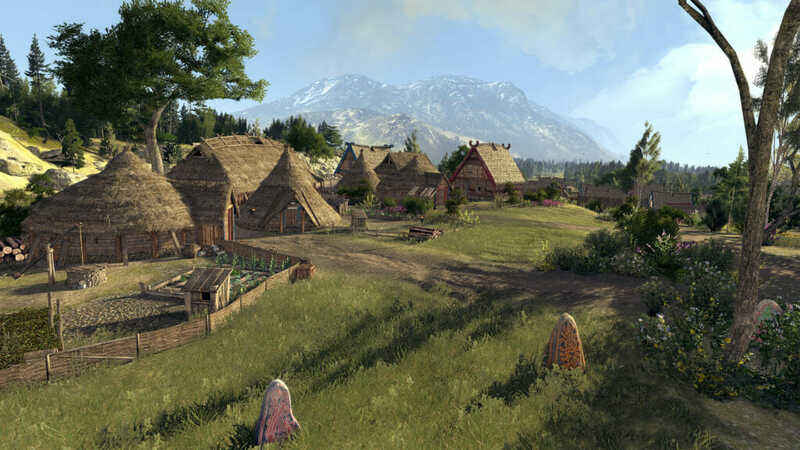 The available building types for each settlement will be pre-defined and based on the characteristics of the land around it. That could be a farm, or an iron mine, or an abbey. In this way the system is more of a cross between the SHOGUN 2 provinces, with resource buildings located outside the main settlement, but combined with the ROME II and later system that allows for each of the minor settlements to be controlled independently. This means that the vast majority of the buildings that give you food and money exist outside the safety of the major settlements walls. This means that you will have to think about how you keep them protected but it also opens up a new set of offensive opportunities. You could for instance sack the farm provinces of an opponent to trigger a food shortage or occupy their mines to cut off income and cripple their ability to maintain a strong army. Attacking the minor settlements in a province can also be a good way to force a fight by pushing a stubborn opponent to step out from strong defences to protect their interests. We’ll be talking more about the design of the building system and more on the mechanics for provinces closer to release. 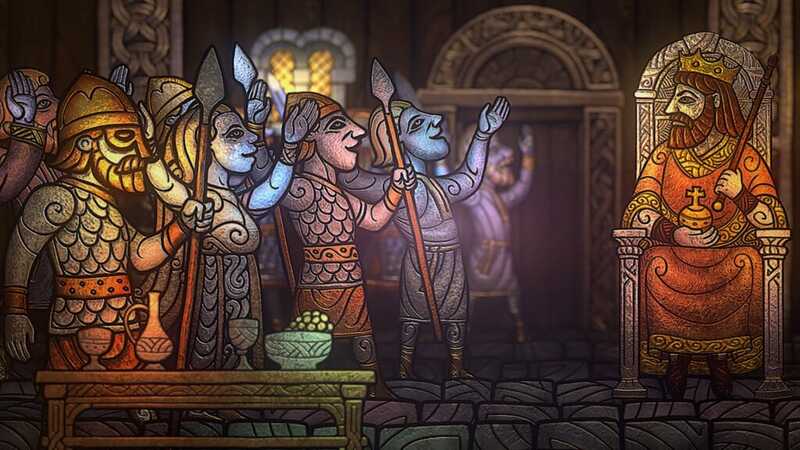 That is all for this hefty update, next time I’m going to start talking about how we’re building the narrative for Thrones, both those that emerge from the sandbox nature of the campaign and from scripted events. Right click on the images and open link in a new tab to see the full-sized image.